Wolfsburg / Los Angeles — Volkswagen will debut one of the sportiest compact all-rounders at the Los Angeles Auto Show: the new Golf R Variant. For the first time in the history of the Golf R, this iconic all-wheel-drive compact sports car will be produced as a station wagon. The exclusive model has 221 kW / 300 PS (296 horsepower) and 280 pound-feet of torque. The power is transmitted to the pavement via a standard 6-speed DSG® dual-clutch automatic transmission and permanent 4MOTION® all-wheel-drive system. The chassis features a lowered sport suspension—0.8 inches lower than a stock Golf—the innovative progressive steering system and a stability control system, “ESC Sport”, which can be deactivated for use on a racetrack. Optional highlights include the newest generation of the DCC adaptive damping system with a driving profile selector that features a Race mode. The Golf R Variant accelerates from a standstill to 80 km/h (50 mph) in only 3.8 seconds and to 100 km/h (62 mph) in 5.1 seconds. This sports car in a station wagon body is electronically limited to a top track speed of 250 km/h (155 mph). The turbocharged four-cylinder engine is very fuel efficient: in the New European Driving Cycle (NEDC), the sportiest Golf wagon of all time only consumes 7.0 liters/100 km (34 mpg); this equates to CO2 emissions of 163 g/km. The Golf R Variant is one of very few sports cars that can’t fully support an owner’s lifestyle: it can take a whole family and all their belongings if needed. This Volkswagen offers an impressively large trunk, even with five people on board, and has cargo capacity comparable to many compact SUVs if the rear seats are folded flat. 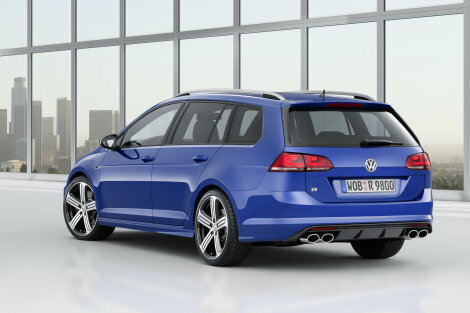 The Golf R Variant is distinguished from other Golf wagon models in a number of areas. At the rear, it has a new R design bumper, a high-gloss black diffuser, four chrome exhaust tips, so-called “aero flaps” on the D-pillars, cherry-red taillights and LED license plate lighting. At the front, the Golf R Variant also has an R-specific bumper with particularly large air intakes, a distinctive radiator grille (with “R” logo) as well as Bi-Xenon headlights with integrated daytime running lights. The LED DRLs form a distinctive dual “U” design beneath the headlights. From the side, the Golf R Variant is characterized by body-colour, “R” style sills, “R” logos on the front fenders and “matt chrome” door mirror caps. The 18-inch Cadiz aluminum-alloy wheels have been specially designed for the R models and are fitted with 225/40 tires; clearly discernible behind them are the black-painted brake calipers that also sport ”R” logos. The car can also be ordered with optional 19-inch Cadiz and Pretoria aluminum-alloy wheels. The Golf R Variant is equipped with sport seats with a fabric and Alcantara® material mix. The look is finished off with decorative stitching in crystal gray and an “R” logo on the seat backrest. Other interior features include blue ambient lighting, automatic air conditioning, and the Composition Touch infotainment system. As an option, Volkswagen also offers a Nappa Carbon leather package for the Golf R Variant. Here, the outer seat surfaces, inner side support panels and head restraints are all upholstered in dark Carbon Nappa leather. Meanwhile, the middle seat panels may be ordered in either dark or light Nappa leather (anthracite or modern gray). Leather is also used to trim the “R” design three-spoke sport steering wheel that has another “R” logo integrated into the lower crossbar. All the leather elements are highlighted by decorative stitching in contrasting crystal gray. The rear seats have the same appearance as those in the front. With five people on board, the car has 605 litres (21.4 cubic feet) of cargo space, loaded up to the back of the rear seats. Up to the front seats and up to the roof, there are 1,620 litres (57.2 cu ft) of luggage room. The cargo area up to the rear seat is 1,055 mm (41.5 inches) long; up to the backs of the front seats, it’s 1,831 mm (72.1 in) in length. The cargo floor in the luggage compartment can be varied in height or completely removed in just a few movements. Another standard feature is the cargo space cover that’s designed as a roller blind and can be stored, along with the rear net partition, under the cargo floor. The 60:40 split rear bench can be released via levers in the side of the trunk; the seat backs automatically fold forward, creating a nearly level surface with the cargo floor. The Carbon Race design is used to decorate the instrument panel and door trims. The standard ambient lighting is also integrated in the door trim panels, while the sill kickplates are also illuminated in blue. The pedals and footrest on the driver’s side are designed in a stainless steel look and the floormats have upgraded piping in a contrasting colour. The instruments and the touchscreen’s start menu were also modified. When the ignition is switched on, the illuminated light-blue tachometer and speedometer needles sweep once around the entire gauge to the endpin—in the speedometer’s case, to the 320 km/h (199 mph) mark. The instrument pointers are also automatically illuminated as soon as the driver’s door is opened. The infotainment system’s touchscreen shows the animated “R” logo as a default. Like the 2- or 4-door hatchback versions, the new Golf R Variant is powered by an advanced four-cylinder EA888 engine. One of the most powerful four-cylinder engines on the market, it delivers 221 kW / 300 PS (296 hp) from 5,500 to 6,200 rpm, and its maximum torque of 380 Newton meters (280 lb-ft) is available over a broad speed range from 1,800 to 5,500 rpm. The turbocharged and direct injection engine has sophisticated features such as water-cooled exhaust gas being fed to the turbocharger through the cylinder head (to efficiently reduce full-load fuel consumption) and a dual injection system with direct and port injection. Thanks to its fully-electronic coolant control system, the TSI engine offers particularly efficient thermal management with a short warm-up phase, which reduces friction losses and fuel consumption. The engine also has variable valve timing on the intake and exhaust side, along with variable exhaust valve lift. This enables optimal control of the charge exchange process for better performance, fuel economy and low emissions. The Golf R has always featured permanent 4MOTION all-wheel drive and the R Variant follows that lead. The latest generation 4MOTION system is coupled to an automatic 6-speed DSG dual-clutch automatic transmission, which has a manual shifting option. The 4MOTION system is equipped with a Haldex®5 coupling that is activated by an electro-hydraulic oil pump. The system can shift drive torque almost instantaneously. When operating under a relatively low load or during coast down, the R Variant acts like a front-wheel-drive car, with the rear wheels disengaged in order to save fuel. However, the rear axle of the Golf R can be engaged in fractions of a second whenever necessary. In addition to the Haldex coupling that acts as a centre differential, there are four electronic differential locks (EDL) integrated in the stability control system (ESC) that act laterally. In addition, the Golf R Variant is equipped with XDS+® at the front and rear axles, which brakes the wheels on the inside of a curve during fast cornering, thus reducing understeer. Like the Golf R, the R Variant is equipped with the “ESC Sport” stability control system as standard. The system is activated by a two-stage switch on the centre console. When the driver presses this switch briefly, Electronic Stability Control (ESC) switches to the “ESC Sport” mode. In very fast driving on a racetrack, the ESC system has a higher threshold in this mode. When the ESC button is pressed for longer than three seconds, the system is fully deactivated for high-performance track driving, a feature that is available only on the Golf R.
The Golf R Variant has progressive variable-ratio electric power-assisted rack-and-pinion steering. This is an elegant solution to a common problem with steering systems, which is that different speeds and maneuvers ideally require different steering rates. In this case, Volkswagen has spaced the teeth on the steering gear’s rack more tightly towards the centre. The lower steering ratio in the centre means that the car responds more quickly when entering a turn, while the higher ratio at the ends of the rack reduces the amount of effort needed near full steering lock, such as when parking. The steering wheel needs just 2.1 turns from lock to lock, whereas the standard Golf needs 2.76 turns. Another exclusive feature on the Golf R Variant is the Driving Profile Selector, which is normally optional but is standard in conjunction with DCC adaptive damping. The feature has four programs in the Golf R Variant, and five in conjunction with DCC: “Eco”, “Normal”, “Individual”, and a “Race” mode that has been specially designed for the Golf R. In combination with DCC, “Comfort” mode is also available. In “Race” mode, which is designed for high-speed track driving, damping is increased and engine response and the shift points of the DSG transmission are configured to be even sportier. In the “Individual” driving profile, the driver can combine mode settings for various individual parameters. In “Eco” mode, the engine, the air conditioning unit and other auxiliary systems are controlled for optimal fuel-efficiency. There is also a coasting function in Eco mode; when the driver releases the accelerator pedal, such as slowing down when approaching a traffic light or when descending a hill, the DSG disengages and the engine idles.